The record breaking RBI occurred during a Brewers 17-3 thrashing of the Detroit Tigers. Hank Aaron drove in Sixto Lezcano on a third inning single off of Verne Ruhle. Of course history sometimes changes. Apparently since 1975 Babe Ruth, who died in 1948, has collected five RBIs. SABR researcher Herm Krabbenhoft has gone through SIGNIFICANT research and established that Babe Ruth had 2214 RBI, or five more than was thought in 1975. It is interesting to note that despite the inflation of run scoring in the 1990s-20002 Hank Aaron remains the leader in career RBI. Not so much for Mickey Mantle, his 1509 RBI now places him 53rd overall. Hank Aaron played one more season after the 1976T #1 card was produced and finished his career with 2297 RBI. Mickey Mantle's 33 spot fall is not all due to PED era players, 19th century players such as Cap Anson are now on the list. Lou Gehrig and Ty Cobb both lost RBIs. The Most significant Phillis player on the list is Jim Thome. 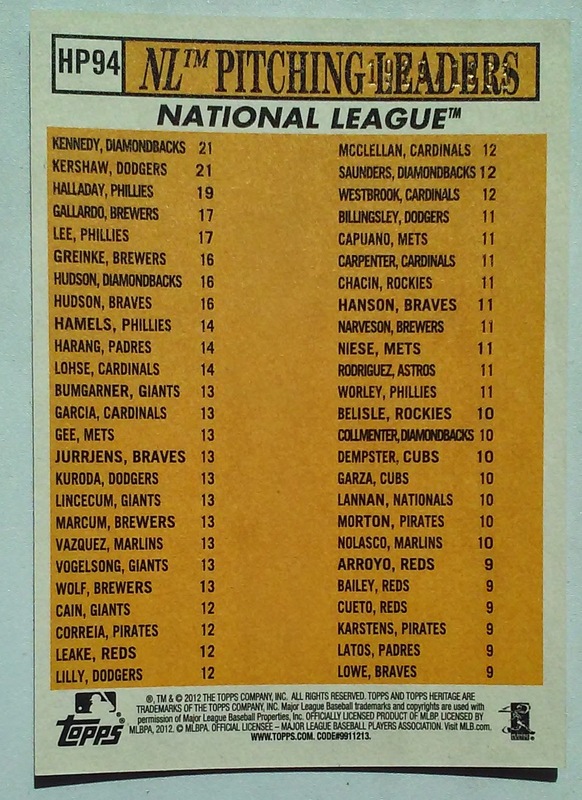 The 1976 Topps Record Breaker subber honors baseball events that happened the previous year. I wasn't planning on formally reviewing this set, but it is a small (6 cards) and I may post on these as the Anniversaries pop in 2015. I did have this card when I was a kid, but it is gone now. It is the only one of the six cards that is not in the present Phungo Collection. At least that is who they selected back in1991 the last time they had the 10th overall pick. The Phillies will pick in the same spot in the upcoming 2015 draft and with that in mind today we are going to take a look at the history of the MLB #10 pick. Despite the fact that Tyler Green was an All-Star for the Phillies in 1995 the pick has to be considered a disappointment. At the all-star break in 1995 Green was 8-4 with a 2.81 ERA, unfortunately he would not win another game that season. He finished at 8-9 with a 5.31 ERA. Three years later Green pitched his final game at the age of 28. His final career was a -0.5 (32nd among draftees that made the majors) and below replacement level. 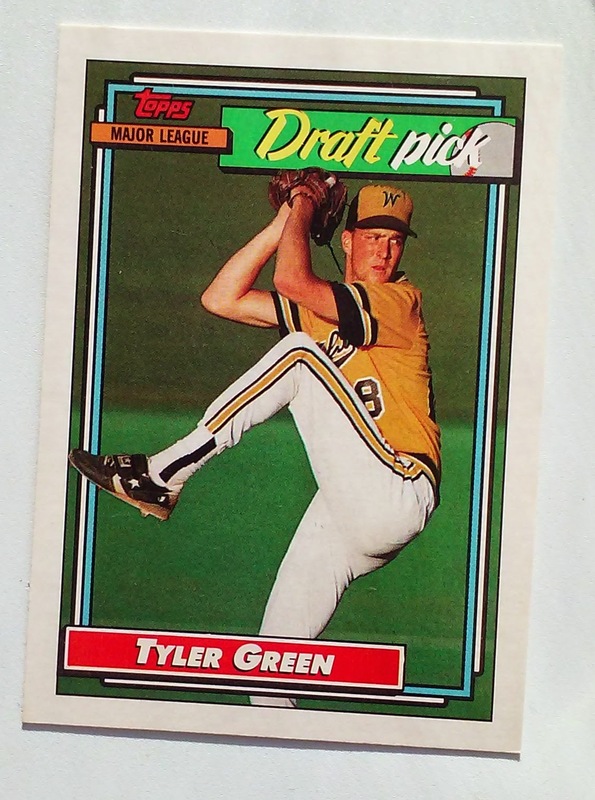 Of the 47 players drafted #10 between 1965 and 2011 thirty-nine made the majors (83%), Tyler Green is among that 83%, however he is not one of the 25 players (53%) who had a positive career WAR. 16 of the players have had Career WAR of 8 or above (34%). Eleven Players hit 20 or above (23%). The Best career WAR among #10 Picks belongs to Mark McGwire (62.0), There is no #10 pick in the Hall of Fame however arguments could be made for Robin Ventura (55.9) and Ted Simmons (50.1) who are both current Hall of Stats members. Notable active players from the #10 club include Giants Pitchers Tim Lincecum (22.5 WAR) and Madison Bumgarner (17.6). The most significant position players among actives are Cameron Maybin and Jason Castro. It also should be noted that this is the draft that the Yankees picked Brien Taylor #1 overall. Taylor never played in a major league game. Well first off the Phillies need to do better with their 2015 pick than Tyler Green. He may have been an All-Star, but his contributions beyond that were negligible. Baseball-Ref defines +2.0 WAR as a starter and +5.0 as an all-star. The +8.0 at #10 is an interesting barometer. 1/3 of the players break that plane and it also equates to four seasons as a starter. That isn't All-Star caliber but the player could be a useful piece on a playoff team. The 20 WAR mark could be looked at as a dozen years of starting or a couple of all-star seasons flanked by 3 or 4 years of steady work. The Phillies have roughly a 1 in 4 chance of finding that player. We are in the middles of the NFL draft mania, an annual event that generates significant Off-Season buzz for the league. The MLB draft doesn't do as well for a variety of reasons, it is in-season, The Collegiate exposure of draftees is minimal at best, Picks are not tradeable, and the players are too far away from the majors. MLB also does little to promote the event. Why not have at a public venue and invite fans to the festivities with Baseball Alums and autograph opportunities. Seems like a promotional no-brainer. The White Sox are in Baltimore not playing a baseball game. This post was supposed to be a happy one where we make up for missing out on Luis Aparicio's 80th Birthday last year. I get to Baltimore a couple of times a year, typically just ballgames but also concerts, touristy weekends and guys outings - My bachelor party was there. I have friends that live and work in the city and I think about their physical and mental safety. Hopefully some degree of normalcy will soon return. In between two stints with the ChiSox Luis Aparicio spent five productive seasons with the Baltimore Orioles including the O's first World Championship Season, 1966. During his Oriole years Aparicio made two All-Star teams and led the league in Stolen Bases twice. His 57 steals in 1964 remains the Orioles single season record. On the defensive side of the ball he led AL Shortstops in Fielding Percentage four times and won a pair of gold gloves. 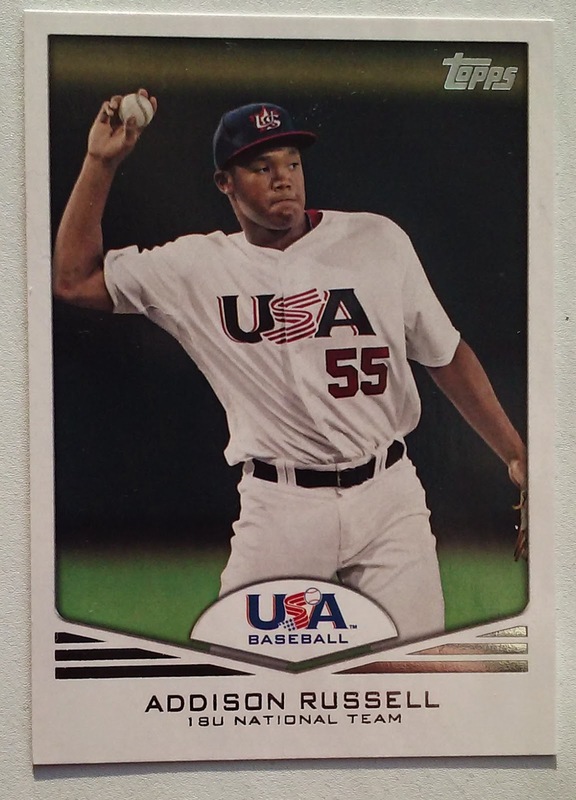 For it's 2015 Heritage set Topps elected to place Orioles Rookie Second Baseman Jonathan Schoop on card #90 which Aparicio occupies on the original. 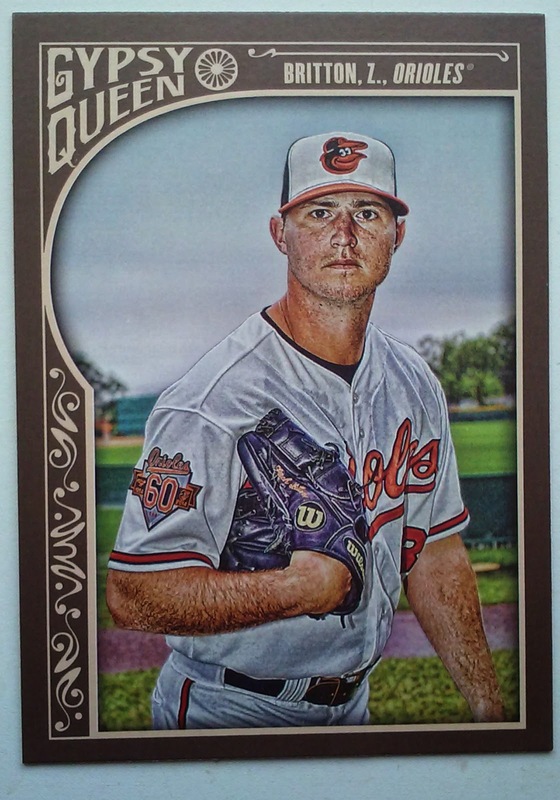 Not sure why Topps elected to go with Schoop over the obvious position match of JJ Hardy. The only think I can come up with is there is the middle infielder connection and Both Aparicio and Schoop have similar batting stances on their respective cards. Regardless of your thoughts on Alex Rodriguez climbing up another rung on the Lifetime Home Run Ladder the occasion does give us an opportunity to re-examine the careers of baseball legends of the past. A-Rod is currently (2015 04 27) standing at 659 Home Runs, one behind Hall of Fame Centerfielder Willie Mays. When he retired Mays' 660 Career Home Runs ranked #3 on the list behind Babe Ruth and Hank Aaron. 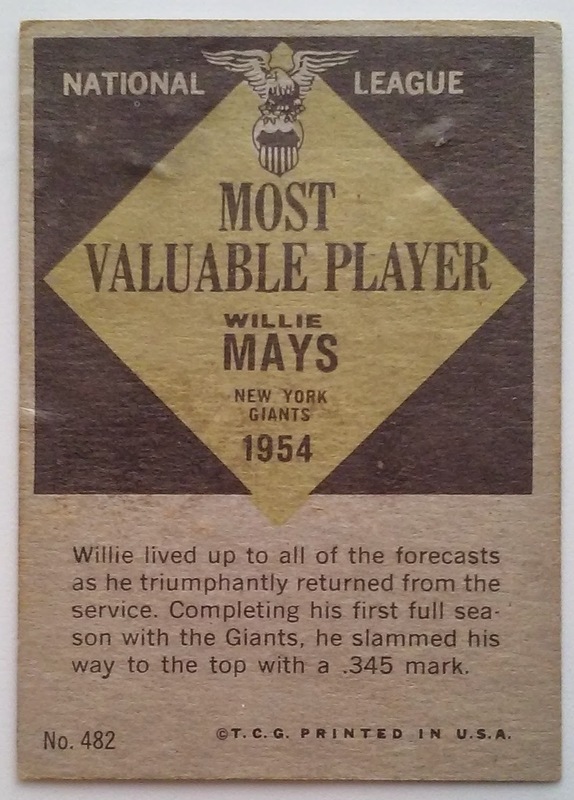 The above card honors Mays' 1954 MVP season when he finished 3rd in NL Home Runs (41) behind Ted Kluzewsk (49) and Gil Hodges (42). Mays may not have won the HR title that year but he got his MVP for leading the league in Batting Average, Slugging, OPS and OPS+ while being a member of the NL Pennant Winning New York Giants who went on to sweep the Cleveland Indians in the World Series. Apparently Topps Airbrushed Mays' cap. I guess they wanted a photo from the year that the MVP was awarded, but did not want to show the defunct New York Giants logo. Or perhaps they could not for legal reasons. I laid down $9 for this card at a show in 2009. That is probably a bit of an overpay for a card in such marginal condition. Nice text, there is acknowledgement of Mays' military service in the year immediately prior to his MVP. 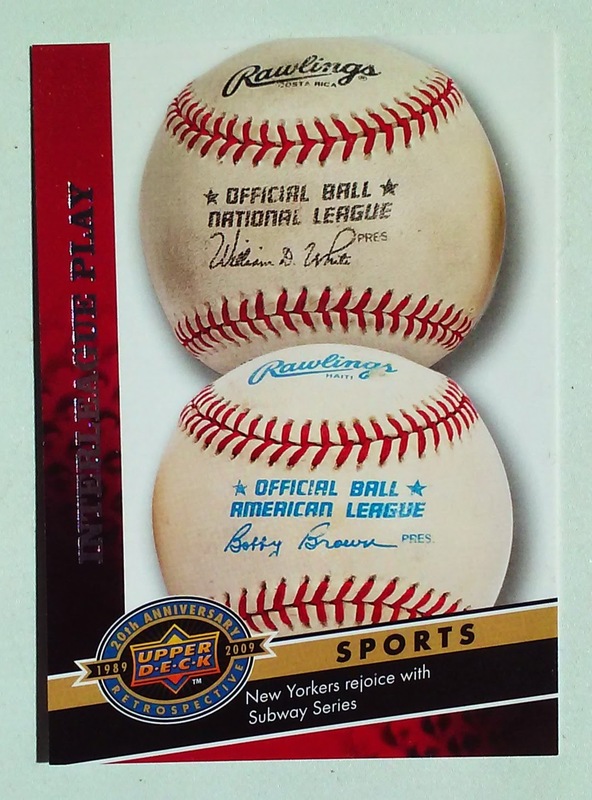 Also note that here on the back of the card Topps elects to use the New York Giants team name. The leader board as of press time on April 27 2015. 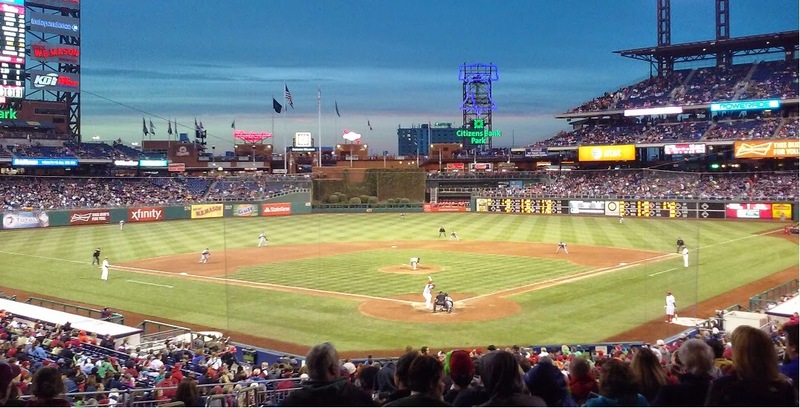 The Phillies hosted the Division Rival Atlanta Braves this past Saturday Night. 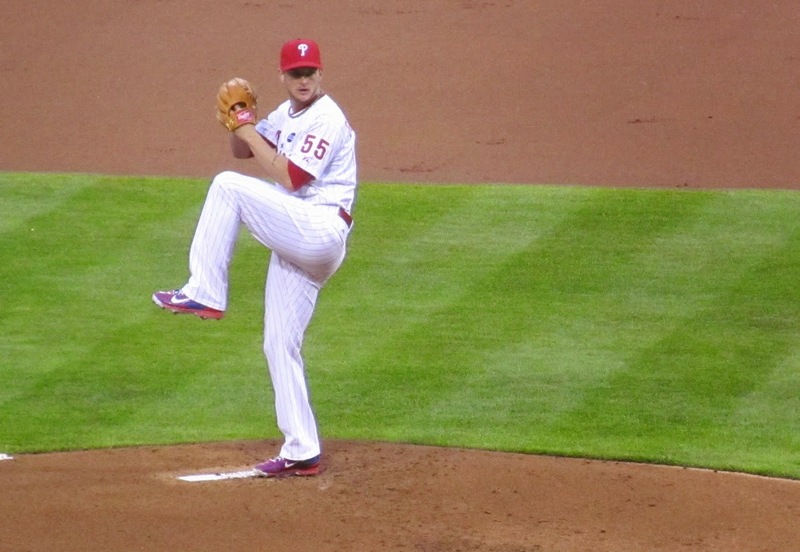 Despite a terrific start by David Buchanan and a rare Home Run by Ryan Howard the Phils took the loss 5-2. Despite the outcome and the cold, it was a pretty nice night for a game, picturesque sunset photo above. Buchanan had struggled in three 2015 starts, but Saturday Night was different. He didn't allow a hit until the 5th inning and took a 1-hit shutout into the 7th. Unfortunately he couldn't make through that 7th inning and Jake Diekman couldn't help him out. 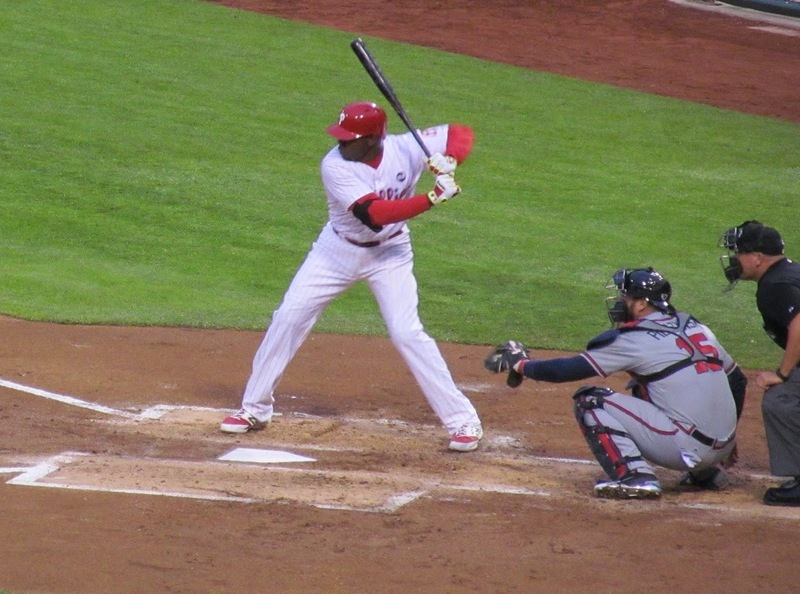 Despite the Loss, Buchanan's start is a positive as was Ryan Howard who had a 2 run homer and looked good in other ABs. The rest of the Phillies offense accounted for zero runs and looked worse that that. Phillies personnel have spun Chase Utley poor start at the plate as bad luck despite good contact. For me there was no evidence of this on Saturday night, Utley had 4 unimpressive ABs. 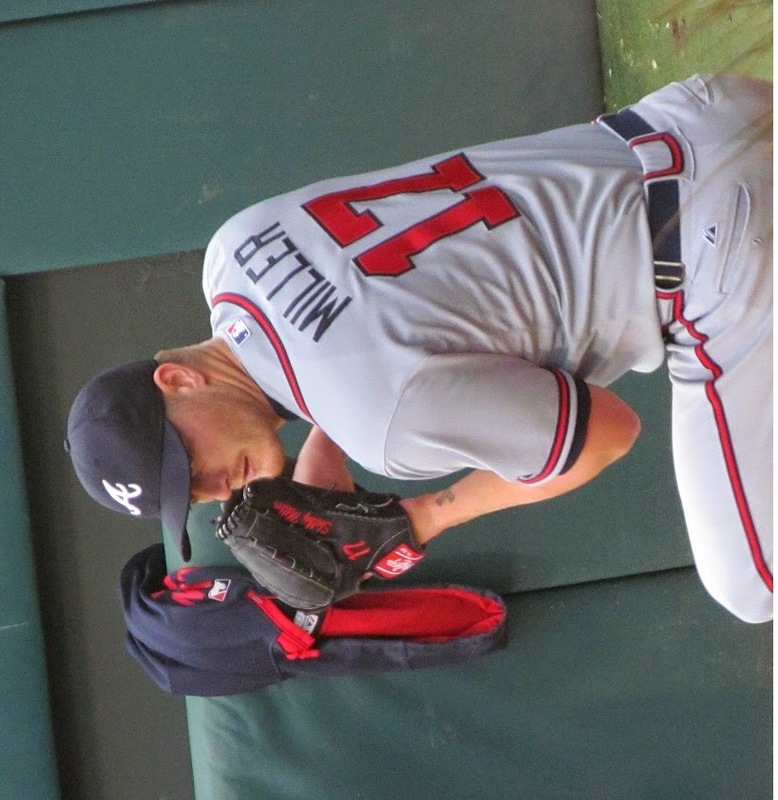 For six innings Buchanan was the better pitcher, but Shelby Miller didn't let this phase him. In his fourth start as a Brave Miller put up six innings allowing only 3 hits including Howard's two run homer. Miller has been steady for the Braves getting 5+ innings in every start and now allowing more than 2 in any of them. 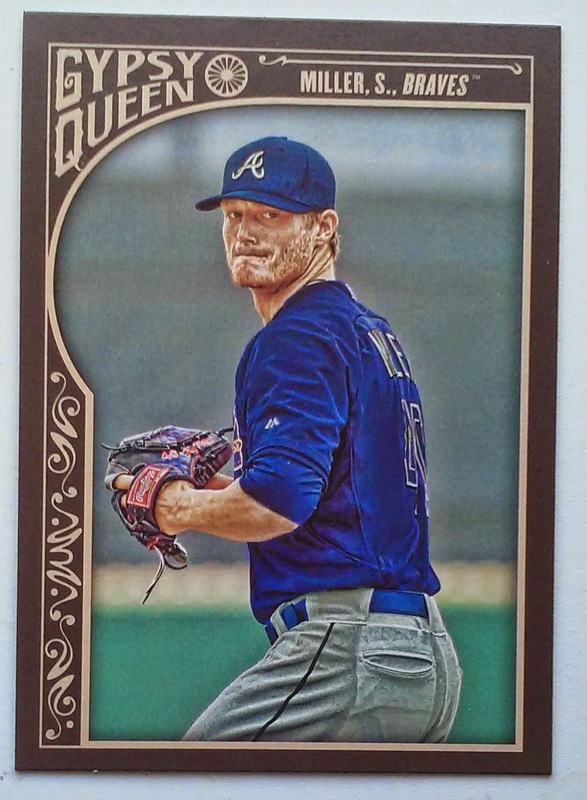 Not sure but this may be Miller's first card as a Brave, picked it up in a Rack Pack a few weeks back. Typically known for his defense Andrelton Simmons showed up with his bat on Saturday night and spoiled David Buchanan's shutout with a line drive home run to lead off the seventh. ***When Jake Diekman came in to pitch the infielders segregated into two groups. I know that they are geographically separated but it defnitely felt like the Howard/Utley and Asche/Galvis weren't interested in hanging out together. ***Freddy Galvis resurrects memories of former Steelers (and Eagles) QB Bubby Brister. He goes down with what appears to be a major injury and lays on the turf. Then 10 minutes later he is up and returning to the field. 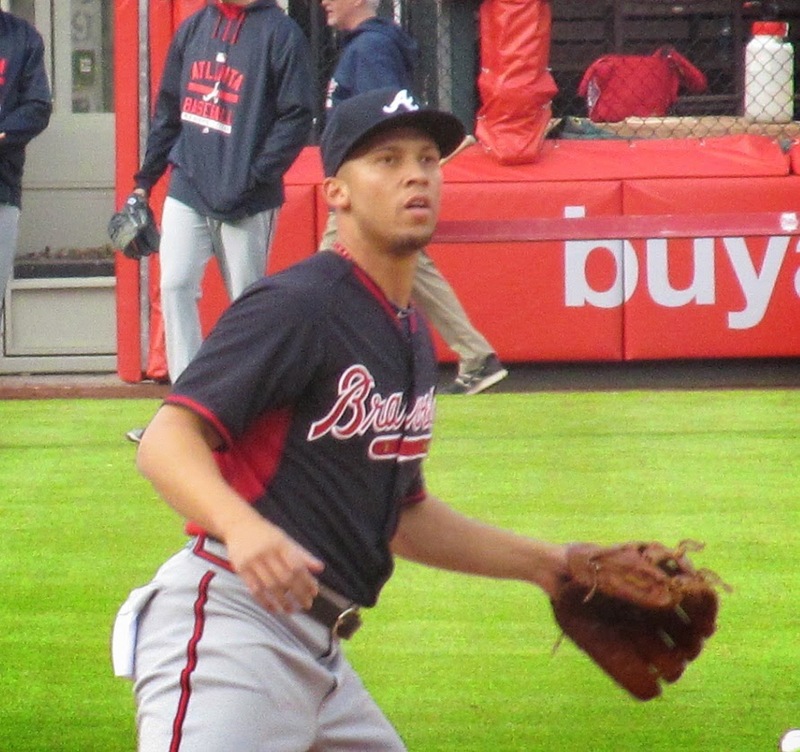 ***I have never seen a player take his fielding as seriously as Andrelton Simmons. After his BP session he took his Shortstop position for repeated grounders with his motor running at a much higher rate than I have seen from other players. ***Shelby Miller was having trouble hitting the right side of the plate during his bullpen warm up. I think this may have carried through to the game, but the Phillies failed to take advantage. ***Jason Grilli gets it, he appeared to be involved in a healthy bit of interaction with the fans prior to the game. ***The Phillies attendance may be down inside the ballpark, but that hasn't hurt the crowds in the tailgate lots. I get to games really early and I was amazed at how many folks were already in the lots. 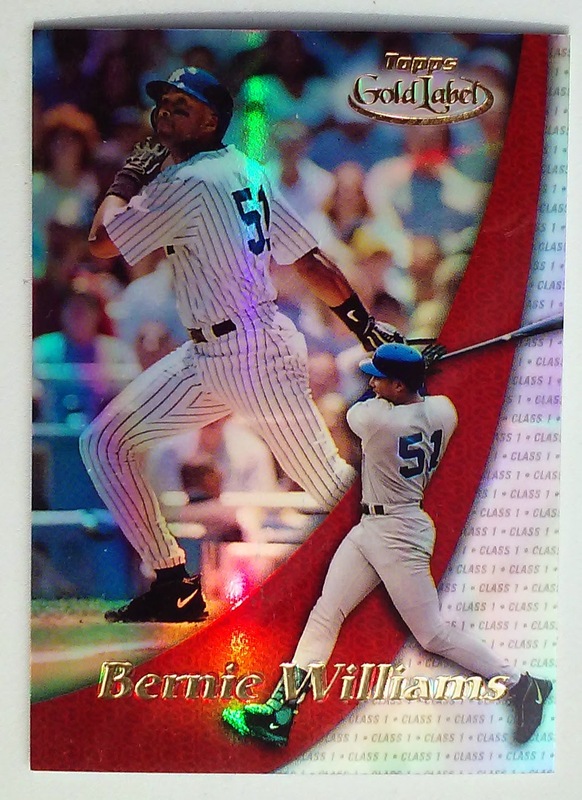 Bernie Williams formally announced his retirement this week despite having not appeared in a game since 2006. It is a good thing that he finally retired, the Yankees are retiring his number in less than a month. 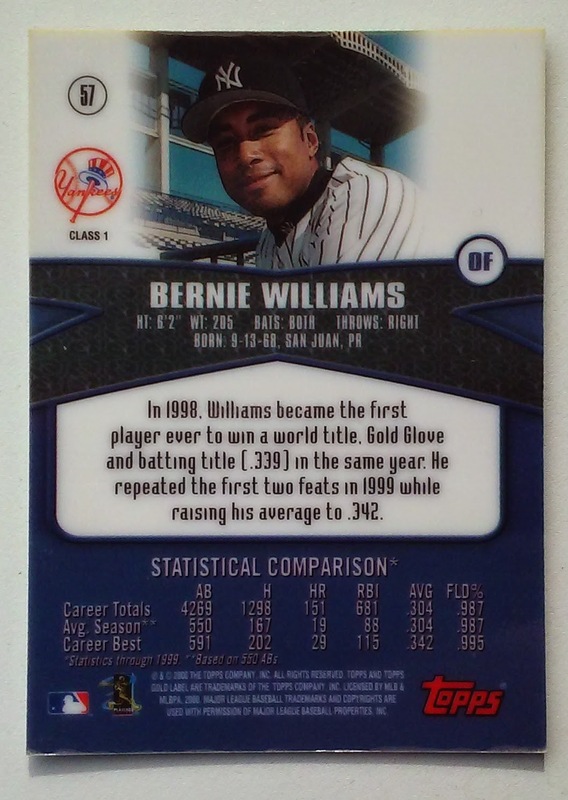 In addition to a nice portrait photo of Williams the flip also has a blurb noting Williams 1998 season in which he won a World Series, Batting Title and Gold Glove all in the same season. An accomplishment that was unprecedented. Williams did make at least one competitive appearance after his unofficial 2006 retirement. In 2009 he played for Puerto Rico as part of the World Baseball Classic. He even threw out the first pitch for one of the games and Team Phungo is happhy to say that we were there. Was in a recent Multi-Sport Group Break run by Thorzul Will Rule. This is a nice one for us Phillies fans as we begin the 2015 season with so much dread. 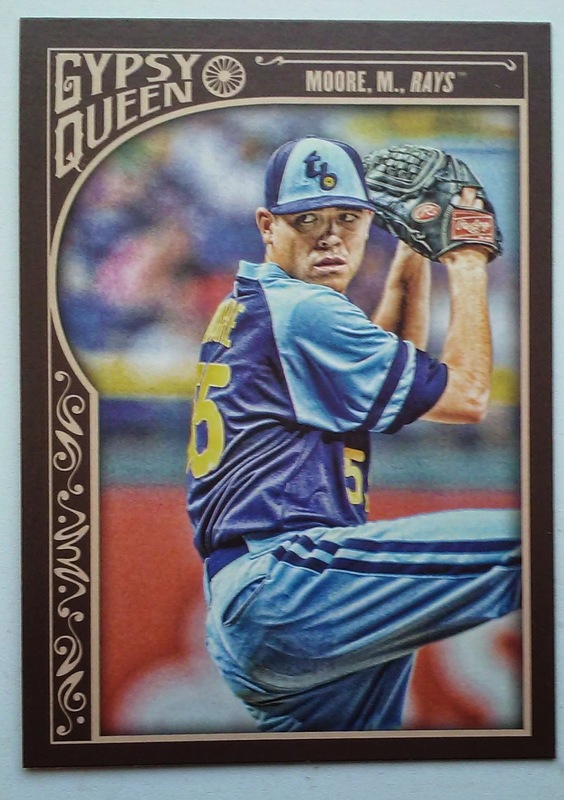 The card serves as a reminder of the good old days way back in 2011 when the Phillies had a rotation so stacked that Cole Hamels was relegated to #3 starter behind Roy Halladay and Cliff Lee. Topps packed this League Leaders card with SIX bobbing heads to match the design of the original 1963 Topps #7 NL Pitching Leaders Card. The trouble is that the NL had a 3 way tie for 6th plays in Wins in 2011. Zack Geinke, Daniel and Tim Hudson all had 16 Wins. 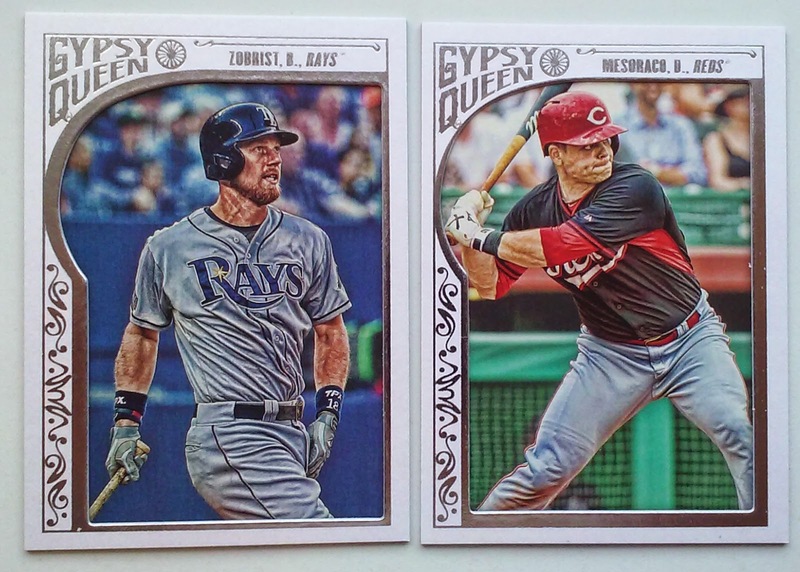 Topps decided to go with six heads rather than stopping at 5. Greinke got the floating head and the Hudson's got snubbed. An oddity in all this is that the Original 1963 Topps League Leaders cards each had 5 players with the exception of ties: The aforementioned card #7 and Card #4 AL Home Runs leaders. 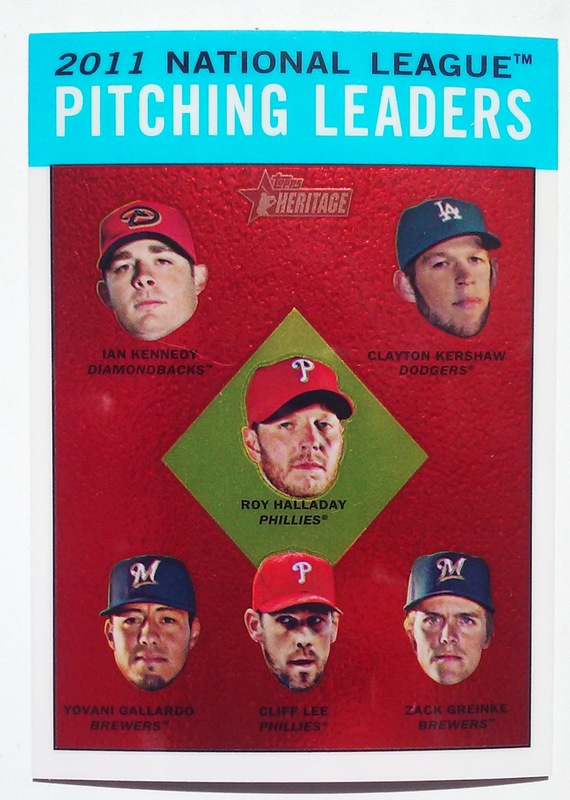 For Heritage Topps had to decide to either A) Echo the original six heads and snub two players or B) go with the default 5 head design and ignore the oddity of the original set. I think the wrong decision was made. I would have gone with 5 rather than put myself in the position to pick and choose which player gets on the card. Another observation is that on the original 1963 LL cards, the player in the center was the overall Leader. 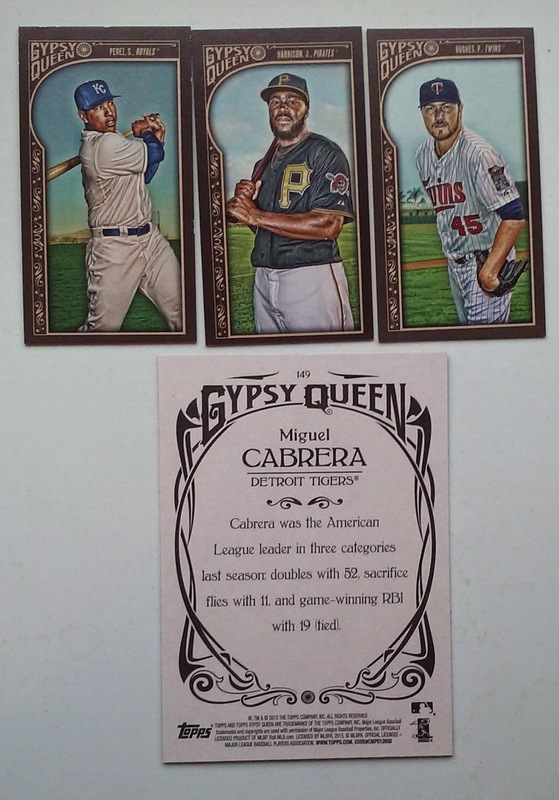 On this card Topps either elected to or accidentally place the pitchers in order from top left to bottom right. Ian Kennedy led the league in Ws, while our hero Roy Halladay finished 3rd. There's your proof of the double Hudson Snub. Both players sit there at 16 Wins with Zack Greinke on the back of the card. This was a four sport break, I had the Vikings and Celtics in the break. I think my Hockey team may have been the Flyers, but it doesn't matter here as like the 2014-15 Flyers we came up emtpy on the ice. I have seen a handful of Vikings games, I am pretty sure Culpepper is the QB I have seen most. 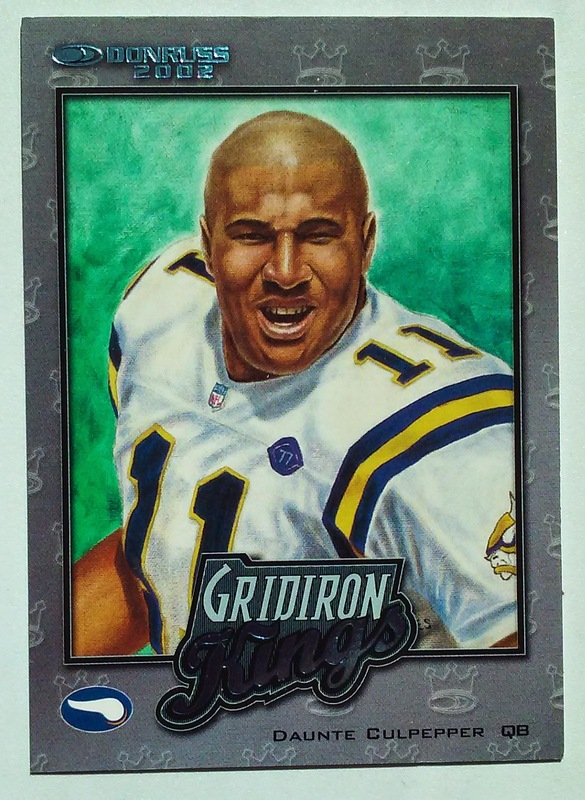 Bigtime violation on Donruss' part here as the Kings part of the Gridiron Kings flair overlays the artists' signature.I did some hunting around to identify the snubbed artist but was unsuccessful. 2008 Topps baseball was a disaster for a variety of reasons. The shame of it is that there is a distinct design with the carnival letters however there were at least two big missteps. 1) The photography for the set was abysmal and 2) The Topps logo being placed Top Center made for ridiculous cropping issues. 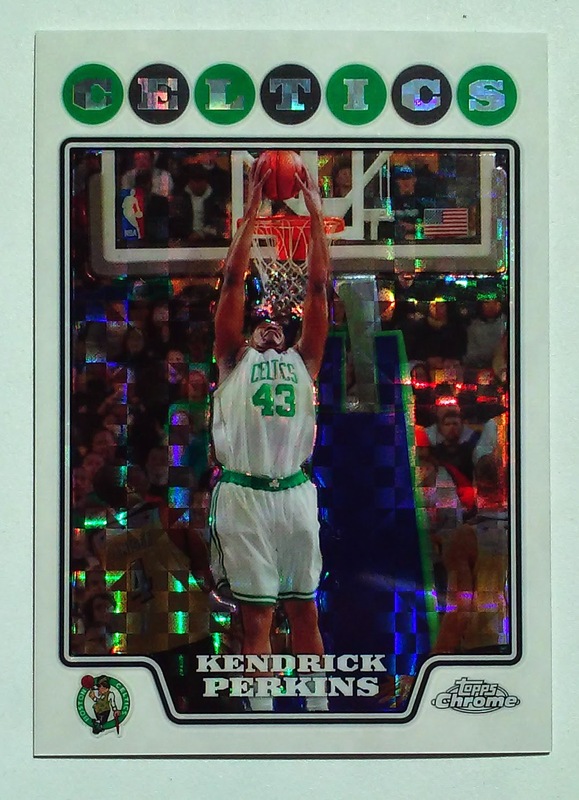 By the time the Basketball set was issued Topps had corrected the logo issue by moving it to the lower right. Additionally the Hoop Photography is an improvement over baseball. 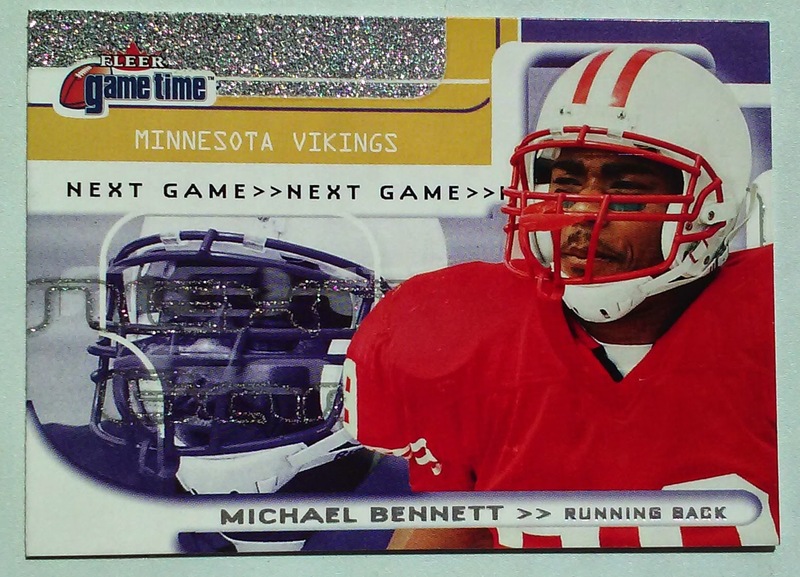 I have a minor college cards collection which this Michael Benntte card will fit into nicely. 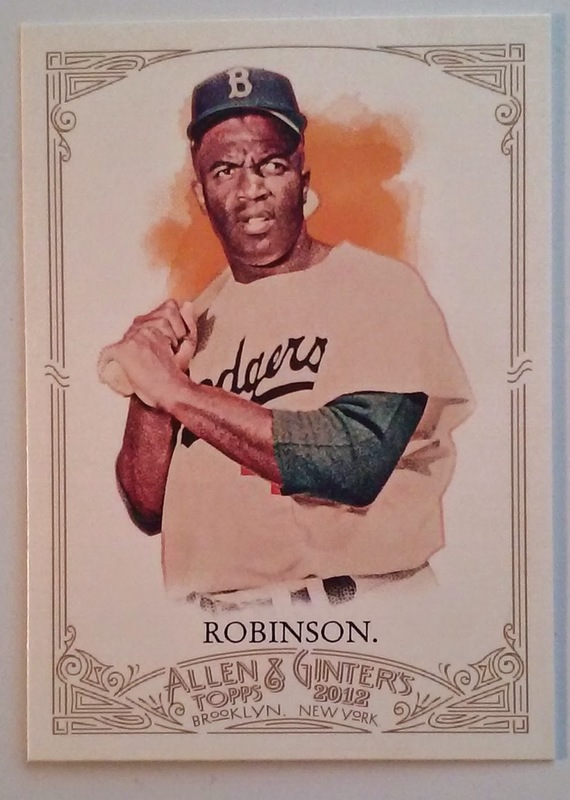 The design on this Fleer card looks like somebody tried to modernize 1956 Topps and failed miserably. 1979 Topps #31 Tom House: Relief Pitcher and Quarterback Coach? I have started hearing Tom House's name a lot recently. For me, the former major league relief pitcher first reappeared in connection with the Million Dollar Arm film. More recently House has emerged locally in discussions of the Football team. The Philadelphia Eagles have picked up Tim Tebow as a QB based off of Tom House's endorsement. The trivia in the Tom House Bio doesn't end with Film and Football. In a 2005 USA Today article he admitted to using steroids as far back as the 1960s. He estimated 6-7 pitchers on every team were experimenting with Steroids or HGH. On a much happier note, House is also the know for catching Hank Aaron's record break 715th Home Run. I hope that Tom House is right about Tim Tebow, I find him fun to watch and he is always great press. I also hope House is wrong about the steroids. A week after calling up Baseball America's #1 Prospect, the Cubs are not calling up the BA #3 Prospect. 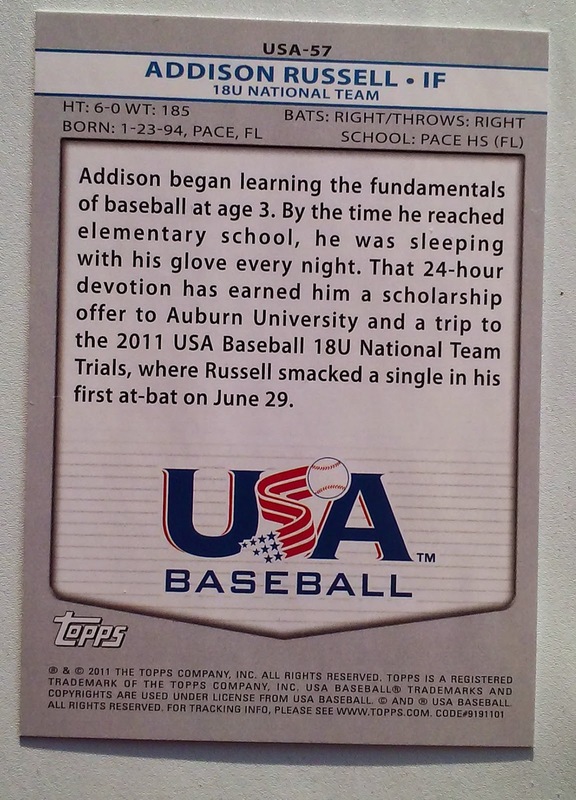 This is a card from the 2011 USA Baseball set which was issued when Addison Russell was still in High School at age 17. The reverse side gives a snapshot of Russell's devotion to the game. In the early part of the 2015 season the Cubs have become a much watch team. An Addison Russell card was the subject of an interview with a Topps rep on an MLB network. A transcript of the conversation can be found here. Good news for the prospector who picked up the 2013 BowPlat card mentioned in our posting. It is currently up from the $7.77 purchase price in 2013 to $10.50 in current auctions. I have been to numerous festivals throughout my years of concert going. Many of these shows have been to raise awareness for various causes (with varying degrees of merit). 25 years ago on April 21 1990 I went to one to celebrate Earth Day. This means we are now five years further removed from the 20th anniversary than that milestone was from the events inception. 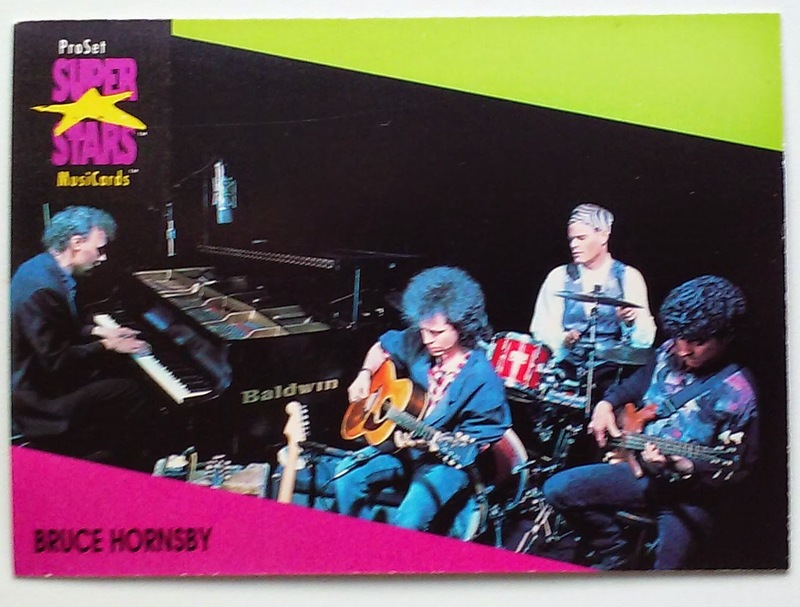 The 20th Anniversary Concert held at Columbia MDs Merriweather Post Pavillion featured at least a dozen acts including Bruce Hornsby who appears on the above trading card. A few weeks ago we mentioned Mark Langston starting a no-hitter (that was completed by teammate Mike Witt). While I was reading up on Langston I cam across an interesting piece of celebrity networking gossip. Langston and Bruce Hornsby are close friends. They met after a Range concert in Seattle. When he was a free agent prior to the 1990 season Mark Langston checked in with Bruce Hornsby while scouting the Dodgers and Angels. The first phone call Langston got after pitching his no-hitter was from Bruce Hornsby. Bruce Hornsby and the Range were not the only act involved in the Earth Day Concert. Sunday Night Baseball visits another one of their favorite cities tonight as the St Louis Cardinals host the Cincinnati Reds. When I was younger Ozzie Smith was widely accepted as the best defensive shortstop of his era. Sometimes perceptions of the masses may not match reality. I am very happy to find out that in Ozzie's case baseball fans and writers were correct. Today's advance metrics have revealed that not only is Smith the best fielding Shortstop of his era. He is the best fielding PLAYER of ANY era. There he is, the Wizard all alone at Number 1. And it is amazing how much separation there is between Ozzie and the two spot, 4th and 13th. His dWAR is 10+% ahead of Belanger's and 25% better than Cal Ripken in fourth place. Perhaps more amazing is his dWAR compared with the Pee Wee Reese who ranks 13th all-time. Smith's 43.4 career dWAR is 69% more than Reese's 25.6. Think about that, Ozzie Smith has a Defensive WAR number that is 69% better than the guy that ranks 13th all time. I ran the chart out to #25 just so you can see the first active player on the list Adrian Beltre who had age 36 is climbing up near a lot of Hall of Famers on various leaderboards. 2008 was Upper Deck's second iteration of Goudey. 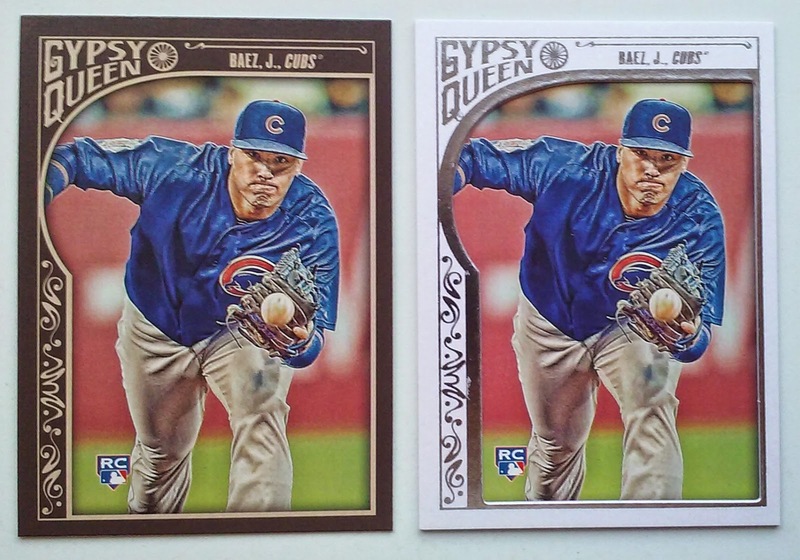 The UD Retro set was inspired by Goudey's 1934 release. 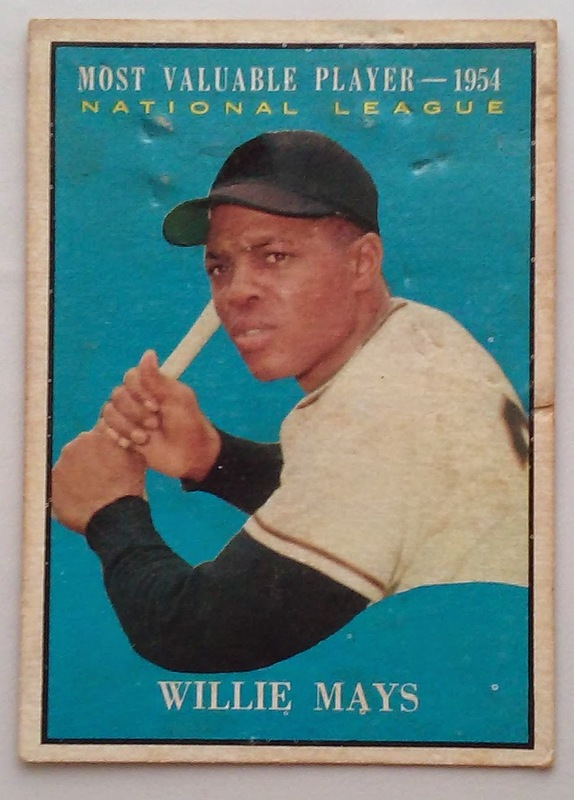 This card was selected for this weeks Sunday Night Baseball Posting because not only do we get to feature a legend for the home team but we also get to recognizing the visiting squad in a small way by having Junior on the card. I also wanted to note that selecting the mustard yellow background for this Goudey card is a nice contrast for the Ketchup Cardinals Red of Ozzie's Uniform. 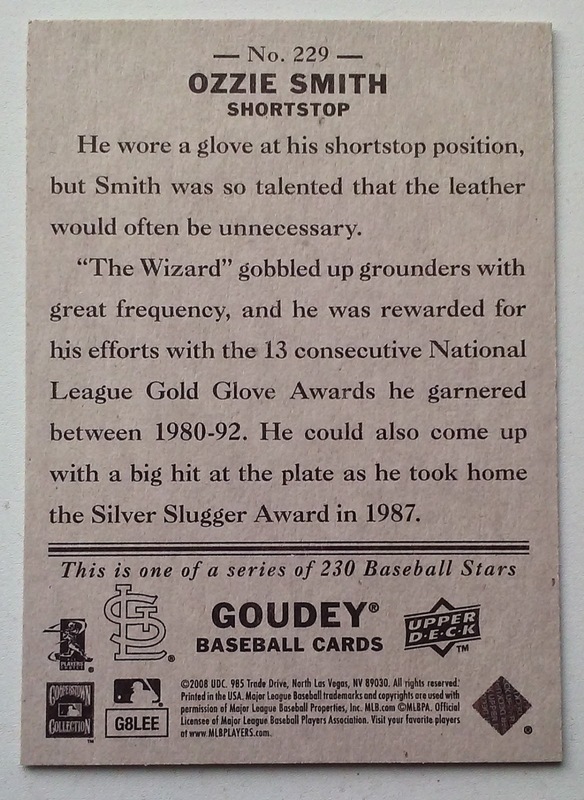 The text echoes the SABR Stats above by mentioning Ozzie Smith's 13 consecutive Gold Gloves and also goes on to mention his 1987 Silver Slugger. 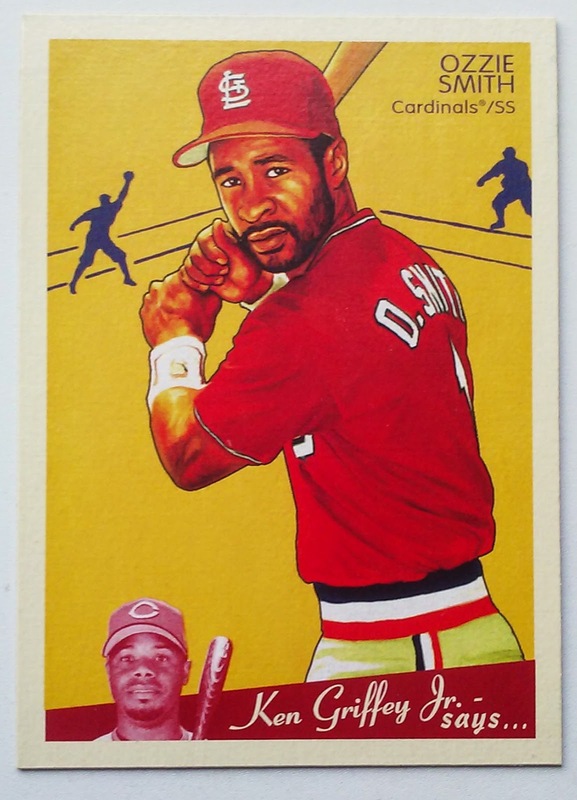 The above Ozzie Smith card is a short print in the set and was packed pulled from a blaster. I understand we have more "Lo-Hitter" than No-Hitter postings right now, but I assure you the real ones are coming. On April 20th 1990 the Seattle Mariners found themselves involved in their second no-hitter moment of the young season. During the opening series of the season they were the victims of a combined no-hitter by Mark Langston and Mike Witt. 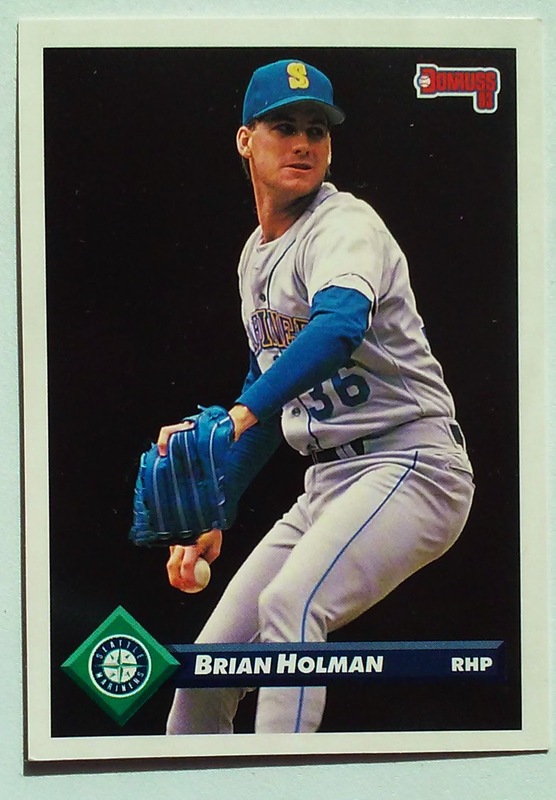 Nine days later the M's Brian Holman was facing the Oakland A's and was perfect for 8 2/3 innings. 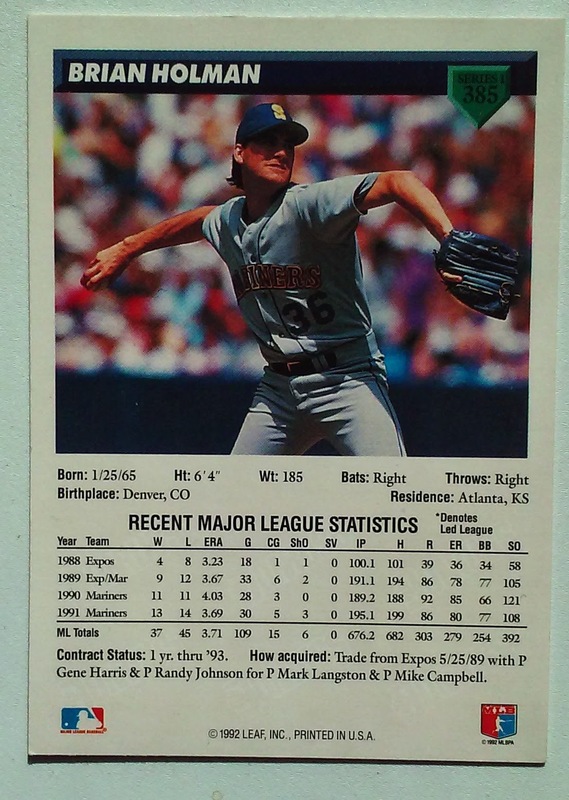 Alas, Brian Holman was not destined to pitch the 8th Perfect Game in Major League History. With the A's down to their final out manager Tony LaRussa sent out Ken Phelps to pinch hit for Mike Gallego. Phelps Homered to deep right field. In one pitch Holman lost perfect game, No-Hitter and shutout. In a bit of Irony after failing to retire Ken Phelps, Holman struck out Future Hall of Famer and on-base machine Rickey Henderson. Yes the Ken Phelps that broke up Holman's perfect game is the same Ken Phelps that Frank Costanza confronts George Steinbrenner about in a 1996 episode of Seinfeld. The most intriguing oddity of the box score is that despite this being an AL game, Brian Holman made a plate appearance. In the 9th inning Holman batted because DH Pete O'Brien came in as a defensive replacement for Alvin Davis. For better or worse Holman reached on a Mike Gallego error. This meant that Holman also had to run the bases late in the game. Who knows, maybe batting or being on the bases tired Brian Holman out just enough that he didn't get everything on a the pitch he threw to Ken Phelps and that late to the fateful hit. This would have likely happened regardless of the error, but Ken Phelps was pinch hitting for.....You got it Mike Gallego. 1990 was Ken Phelps final year in baseball and the Perfect Game busting hit was the last Home Run of his career. In addition to Rickey Henderson the A's formidable lineup included the Bash Brohters, Mark McGwire and Jose Canseco. The Ms defense behind Holman included Ken Griffey Jr covering Center Field and the pre-DH Edgar Martinez at third base. Dave Valle was the man behind the plate. Check the transaction at the bottom of the card. Holman was traded for Mark Langston, who pitched the first Year of the No-Hitter Gem, and was traded with Randy Johnson, who we will be hearing from a bit later in the season. It is a shame that Holman was unable to finish his no-hitter, How many trades involve 3 different players that have been able to accomplish the feat? Today Holman works as a motivational speaker and pitching instructor. This is a companion posting to the column earlier this week on AL league president Bobby Brown. Like Bobby Brown, Bill White was a former player who became a league President. White led the NL from 1989-1994. His playing career was 13 years 3 of which were spent with the Phillies. We ran a more thorough profile last year on the occasion of White's 80th birthday - click here to read the more. The 80th Birthday Column also contains a 1966T card of White for those of you that are interested in 2015 Heritage Originals. 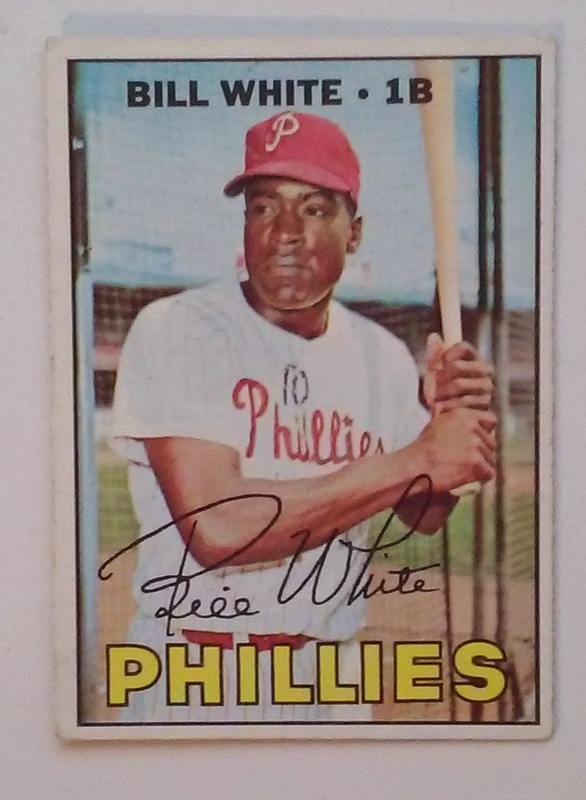 The 1967T card at the top of the post has a facsimile signature that clearly reads "Bill White", a more familiar and less formal monicker than the "William D White" which appears on the NL Baseball above. When grading cards or commenting on their condition, there are several words or phrases that come up: Creasing, Rounded Corners, Faded, Tape, Gum Residue etc. One of those terms is Pencil or Ink for whenever there is writing on the card. At some point someone had scrawled the number 10 on Bill White's Chest. This was his uniform number while with the Phillies. Noteworthy Phillies to where the number were Larry Bowa and Darren Daulton, Michael Young was the most recent active player to don #10, which has now been returned to Bowa in his current role as Bench Coach. GQ isn't my thing, but I was in the store during it's opening week and picked up a rack pack - I am a sucker for those 3 card parallel packs. 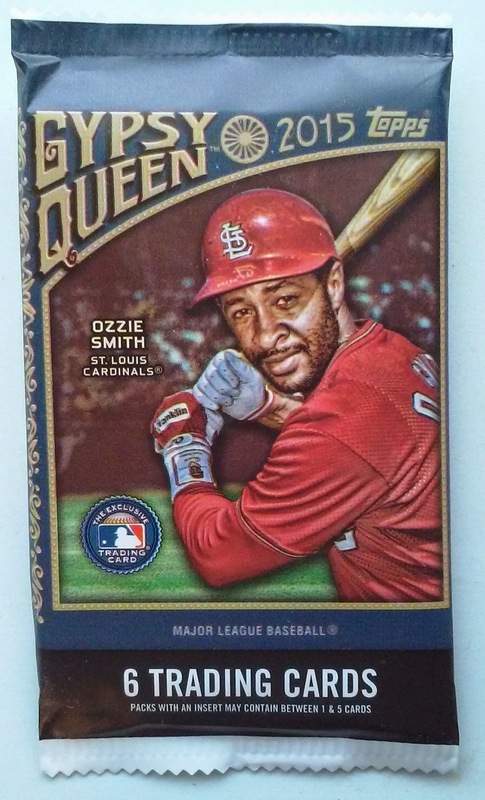 Ozzie Smith on the cover was also a selling point. Racks contain three 6-card packs plus a 3 card framed parallel pack. The price was $9.49. In lieu of a Phils card we are posting a card of Zach Britton from the Team Phungo AL Squad, Baltirmore Orioles. 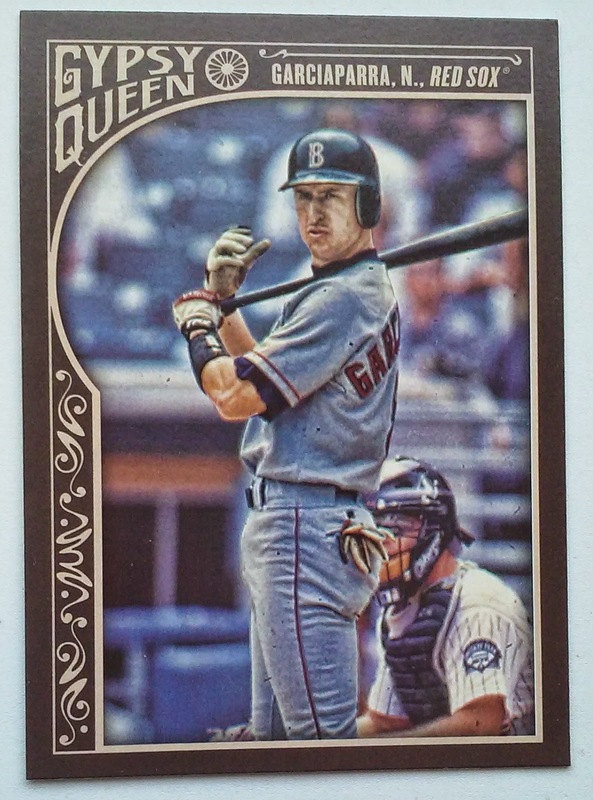 MLB Alums are part of GQ - We didn't get an HoF players but we did get this fine card of Nomar reading the signs from his 3B coach. 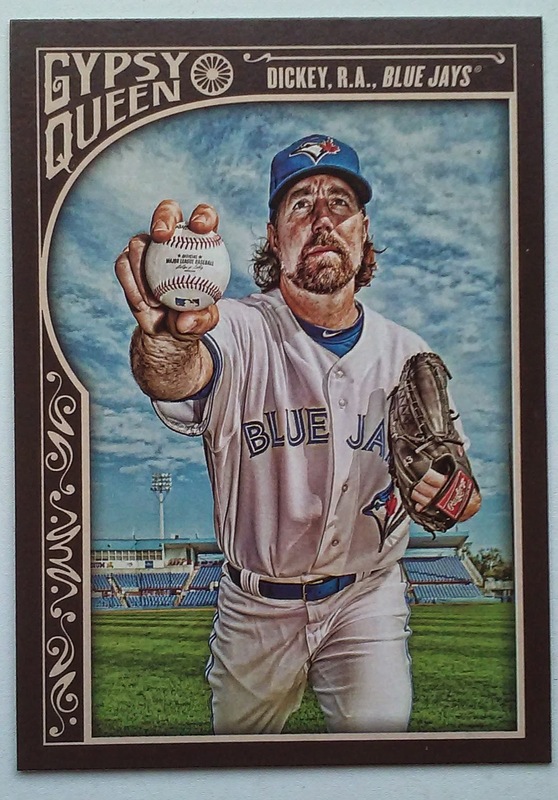 Great Shot of Knuckleballer RA Dickey. He is holding the now defunct Allan H Selig MLB Baseball that we have had under the microscope in a few recent postings. 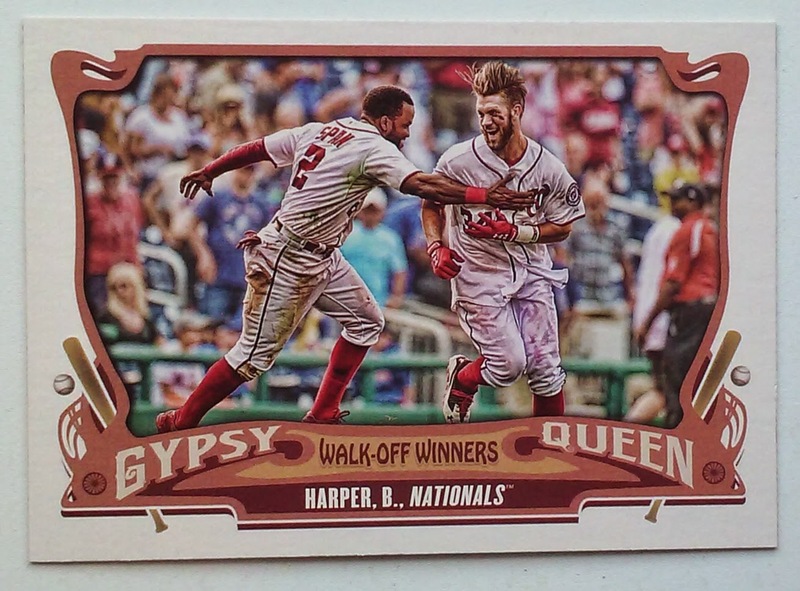 This card reps a game played on August 7 2014, an extra-inning game versus the Mets that Harper won with a 13th inning Homer off of Carlos Torres. Each 3 Pack Rack contains a parallel pack with 3 Frame Cards which are parallels of the base set. The Frame is an actual frame and slightly raised off of the card. The other two Frames in the bonus pack. 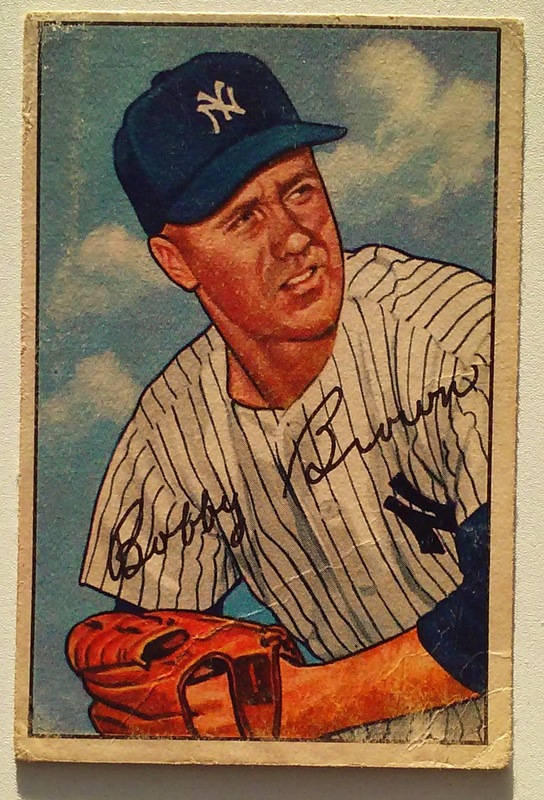 Former AL President Bobby Brown never had a Topps card issued while he was playing, but he does have a couple of cards on the Bowman checklist including the 1952 set. The lower baseball has Bobby Brown's signature as AL President. He took office in 1984 which means there is roughly 35 years difference in the two signatures. I am no handwriting expert but it is interesting to see the similarities in the two autographs. While most of the 1991 Score base set is a bit tired, the cards are so overproduced they can be found EVERYWHERE, there are a few interesting cards spread throughout the set. There are a lot of subsets within 1991 Score, plus there are base cards like the above Bob Welch gem. 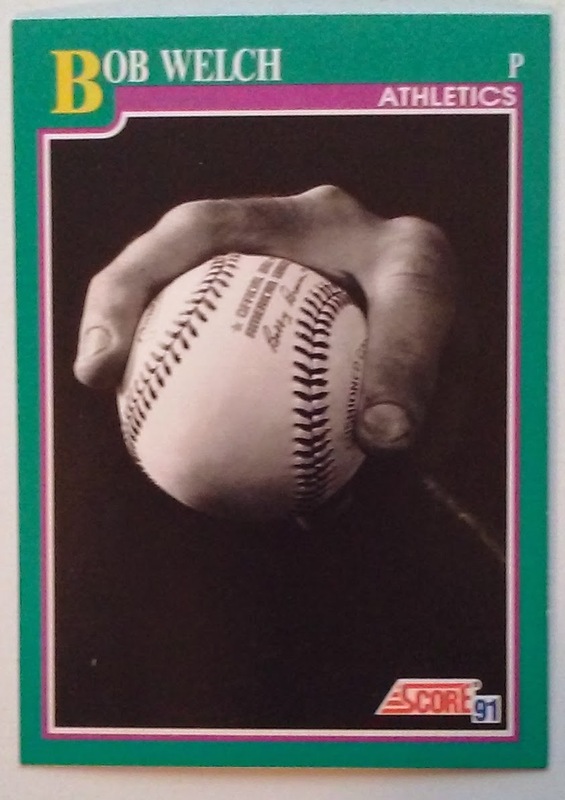 The close up is used to display Welch's grip on the split-fingered fastball. In an 800 card set the image jumps off the page. An interesting nuance one may never think about, unless they are checking in on the differences in Official MLB Baseballs, is that it is an Official AL ball of the era signed by Bobby Brown. So we have found at least two baseball cards that are so detailed that we can see one time AL president Bobby Brown's signature on the horsehide. For those collectors that are dismayed that there isn't a player photo on the front Score did put a nice action photo on the b-side. 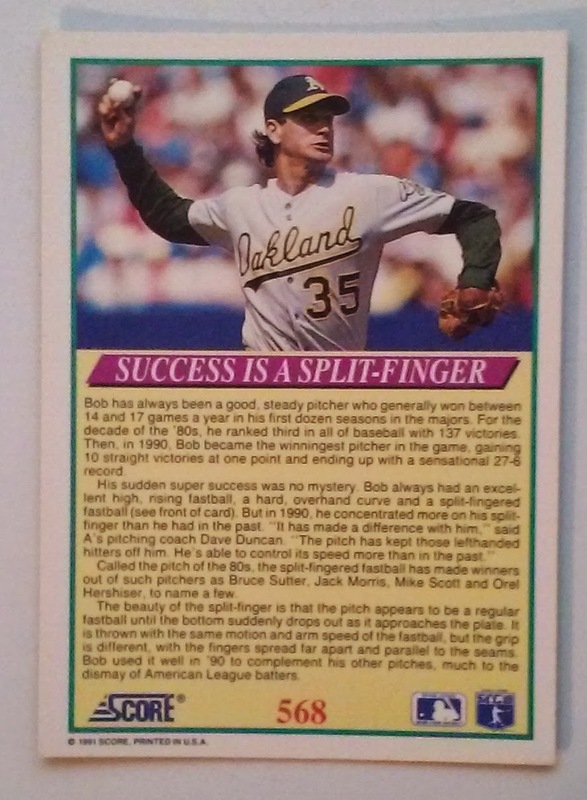 In addition to the pix there is a nice synopsis of Bob Welch's experience with the Split-Finger. Sorry about the blurriness here, if you click on the photo it should enlarge and be a bit easier to read. On Wednesday April 15th Major League Baseball will hold Jackie Robinson Day. Once again every player on every team will wear Robinson's uniform number, 42. This year the Phillies will don their #42 Jerseys while visiting the Mets for Jackie Robinson Day. 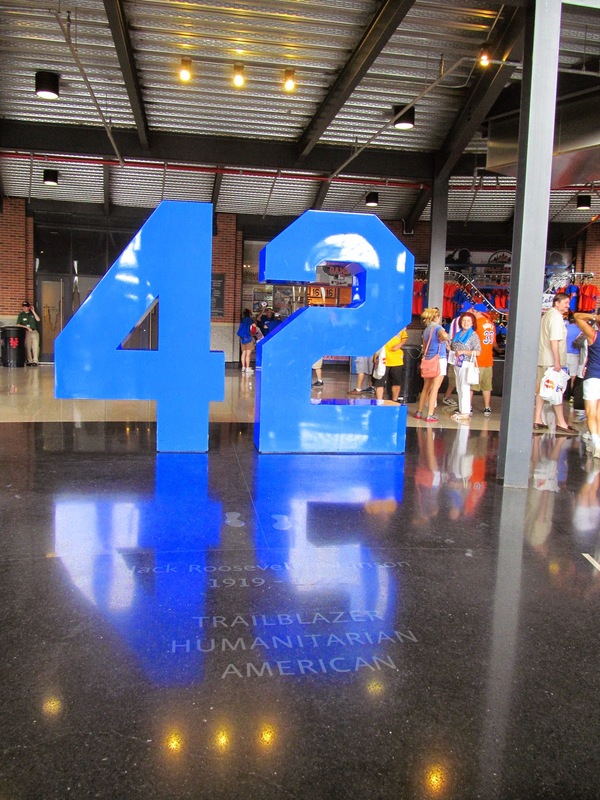 The Mets have honored the baseball heritage of the area in their new home at CitiField with numerous references to Robinson and the Brooklyn Dodgers. The facade on the front of the building is an homage to Ebbets Field, Home of the Brooklyn Dodgers. The entry way is a rotunda with a large Blue 42 honoring Robinson as a focal point. I remember hearing some complaints regarding the amount items in the Mets new stadium that are dedicated to the legacy of the Dodgers. It may be a legitimate concern, but he Mets to have a nice albeit small museum/Hall of Fame off the rotunda. It appears to feature rotating exhibits, we were in New York when the Mets were hosting the All-Star game and they had several artifacts dedicated to past ASG hosted by the Mets and past performances by Mets in other mid-summer classics. The Museum also had both of the Mets World Series Trophy's on display.